This entry was posted in choice, creativity, joy, Love, more love, prosperity, relationships, self-love, Unconditional love on 31 January 2014 by Martina. Be loving. Simply stated: Love others and love yourself, through your words, thoughts, and actions. 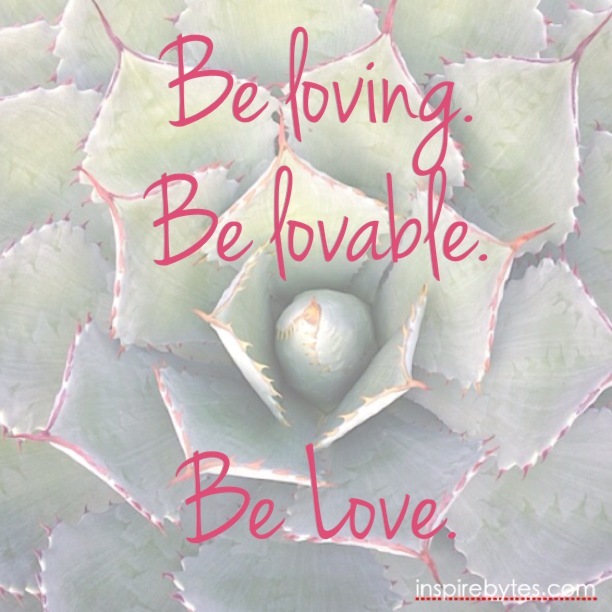 Be lovable. This is not about being cute; it’s about being receptive to love from someone else. Surprisingly, this can be a real challenge for many, but I’m here to say you are 100% WORTHY of love, exaclty as you are. Be Love. Do 1 and 2. Let your actions, decisions, words and thoughts come from the space of love inside you. If you embody 1 and 2, you will “Be Love.” In other words, allow the idea of Love as an energy, a thought, a feeling, to guide you in your day. Use it as a barometer against which you measure your decisions. If, for example, something is out of alignment with Love (like gossip, for instance), you have a choice. You can always choose something new, something different. Always. Is this thought coming from a loving space? Does this action/decision support my intention of being loving and lovable? What is the loving thing to do in this situation? This is all about engaging in the process and allowing yourself to make different choices, being more open to a life filled with Love, both giving and receiving it. Because Love is the essence behind everything you are, and everything you desire (not to mention: creativity, prosperity, and joy! ).